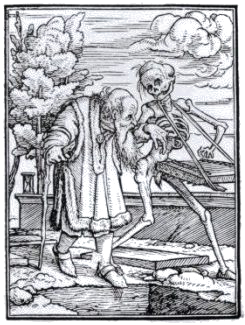 "Death and the Old Man"
Click here for the schedule of meetings in the current academic year. "Death and the Poetry of Poete Maudit Tristan Corbiere (1845-1875) in the films of Jean Rollin (1938-2010)"
Joseph J. Fins, M.D. M.A.C.P. Deborah W. Denno, Ph.D., J.D. "On the Impossibility of Obituaries (Case Study: Artist Agnes Martin)"
"Everything Dead is New Again: Rethinking the 'Tech' in Postmortem Technologies"
"Where in This World is the Human Soul?" "Death Avoidance: A Social Context"
"'A Small but Significant Minority': The Rise of the Anti-Right-to-Die Movement"
"What if You Only Had a Year to Live?" "The Psychological Integration of Death Into Life"
"The Holistic Integration of End-of-Life Experiences"
"Culturally Competent Care in an Increasingly Diverse Society"
"Assisted dying in legal and illegal environments: Experiences of patients, families and clinicians"
"Thinking About Our Changing Journey to the End in 21st Century America"
"Attachment, Loss and Grief (Cont'd.)" "The Death Drive as Conservative Principle, With an Ear Toward Jazz"
"Suite française: Sophie Calle’s Room (The Lowell, New York City, October 13-16, 2011)"
"Mortal Dilemmas: An Experiment in Public Discourse about Death"
"Developments in Palliative Care (Title TBA)"
"Spiritual Care at the End of Life (Title TBA)"
"The Nexus of Death Rituals: External Exits, Internal Objects, Reparation, and Enduring Bond"
"Use of Expressive Art Therapy for Bereaved Children, Teens and Adults"
"Nurshing Home Care Paradox: Ensuring Quality of Life - Fostering Dignity in Death"
"Re-conceiving Rituals of Remembrance: Urban Spaces of Death, Sanctuary, and Memory"
"The Lack of Grief - A Case Study"
"Wishful Thinking: On the grammar of 'hope' in the language of serious illness"
"Failed Organs, New Relationships: Whose Kidney is it, Anyway?" "'Dying at Home' - An Open Discussion"
Austin H. Kutscher Memorial Conference: "Unequal Before Death"
"Mausolea — The Desire for Entombment Featuring the Extraordinary Private Mausolea of the Woodlawn Cemetery"
"Living and Dying: The Human Perspective"
"I Want to Live Until I Don’t Want to Live Anymore: Involving Children with Life-threatening Illnesses in Medical Decision Making"
"Can a Good Death be Achieved in the Modern Medical Technological Era?" "De-Civilization as Response to the Cultures of Death and Societal Trauma in the Second Millennium"
"'The Culture of Death': Perspective and Politics in Medical Ethics"
"The Turn Toward the East: Shifting Metaphors in Hospice Care"
Austin H. Kutscher Memorial Conference: "The Pulse of Death Now"
"Futility, Knowledge, and the Social Orchestration of Death in Botswana's Oncology Ward"
"Dying for One's Country: The Soldier and Sacrificial Death"
"Death in the 21st Century"
"Death in Childbirth-Invisible and Avoidable: Can a rights-based public health approach end the scourge of maternal mortality in Africa, Asia, and Latin America?" "‘Open Access’ in Hospice, and Its Politics"
"Probing Palliative Care: An Anthropological Perspective"
"Brain Injury & the Unintended Consequences of the Right-to-die Movement"
Joseph J. Fins, M.D., F.A.C.P. "Roadblocks to Autonomy in End of Life Decision"
"Hypnosis with Dying Cancer Patients"
"Dying in the Age of the Cyborg"
"Honoring the Dead in the Realm of Organ Transplantation in America: Some Thoughts on the Overlapping of Medical and Military Memorials"
"The Politics of Death in a Human Rights Context"
"The Media’s Central Role in Terrorism and Counterterrorism"
"Terri Schiavo; introduction of the salient issues surrounding the case; discussion on the politics surrounding the case"
"Abu Ghraib and the Psychology of Torture. A Debate with Arendt, Milgram, Zimbardo, and the U.S Government"
"Pictures and Power—The Meaning of Images of the Dead and Dying in War and Conflict—An Exploratory Discussion"
"The Struggle for Coherence in Stories of Catastrophe"
"The Concept of Genocide After Sixty Years"
"Dying to Kill: The Allure of Suicide Terror"
"Dying and Death in Himalayan Cultures"
"The Denial of Death in the Age of Globalization"
"Mourning and Immortality: Ritual and Psychoanalysis Compared"
"Loss, Trauma, and Human Resilience: Culture and Identity Continuity"
"Spiritual Pain at the End of Life"
"The Afterlife As Mirror of the Self"
"What Fools These Mortals Be: Post-Modern Technology and Pre-Modern Dreams of Eternity"
"Covering (Up) Death: Time Magazine's September 11, 2001 Special Issue"
"The Denial of Death in a System-Wide Perspective — A Conversation Between and Ethicist and a Patient Advocate"
"Choosing Affirmation: Antiphony to Becker's Denial of Death"
"Mortality, Salience, Fantasy, and History; with an Addendum on Experimental Studies in Terror Management"
"Dying with a Small 'd'"
"When Denial of Death Undermines Advanced Care Planning"
"The Image of Death in Contemporary News Media: Time Magazine in the Year 2000"
"Humor and Death: The Reality, the Death Anxiety, and the Death Wish"
"A Guided Tour to End of Life Care"
"Controversies and Trends in End of Life Medical Ethics"
"Death in the Christian Theology of Hope"
"Incentives for Permitting Death: Protecting Vulnerable Patients"
"Conflicts in Caring at the End of Life: Nurses Perspectives"
Judith Kennedy Schwarz, R.N., M.S. "Hyperspace and the Quest for Transcendence"
"Death and Life after Plane Crashes"
"Differentiating Grief and Depression: A Clinical Distinction"
"Health Care Decision Making for Gravely Ill Children"
"Ancient Egyptian Mummification: A Physical and Ritualistic Approach to Life after Death"
"Zetetics: A Personal Spin on Life and Death"
"'The Mechanical Graveyard': Death in the ICU"
"The Spectacle of Death: Sati in Early Colonial India, 1818-1827"
"Suicide Prevention on the Front Lines: A Practitioner's Perspective"
"Aspects of the Rebirth Theory in Indian Tradition"
"The Beth Israel Bereavement Program: Helping Families To Cope With Perinatal Loss"
"New Advances in the Treatment of HIV Infection - 1998"
"Beyond the Grave: Cultures of Queens Cemeteries"
"Perils to Existence - Impressions from a Visit to Asia: Environmental Destruction and AIDS"
"Physician Assisted Suicide in the United States - A National Prevalence Study"
"Pragmatic Reflections on Death and Dying in the Hospital"
"The Terminally Ill: Personal Experiences in Counseling Patients and Their Families"
"The Concept of Death Among the Indians of the Northwest Coast"
"Picturing Death: Images and Issues from the French 19th Century Illustrated Press." "Infanticide in America: Witch Hunt or Scientific Inquiry?" "Flesh, Nails, and Bone: Death and Ancestal Memory in a Madagascar Kingdom"
"The Transsexual Experience - Metaphor for Death and Rebirth"
"Assisted Suicide at the Crossroads: The Constitutional and Social Debate"
"Autonomous Dying: Critical Reflections on the Legalization of Physician Assisted Suicide"
"The War on Aids and the Betrayal of Public Health"
"Dying at Home: Implications for Parents, Family and Significant Others"
Sherry Schachter, R.N., B.S.N., M.A. "Religious Cults: Salvation, Suicide and Apocalyptic Endings"
"Receiving an Organ: Gift or Purchase?" New York Regional Transplant Program, Inc.
"The Cemetery as Cultural Resource - Virtual Walk Through Brooklyn's Green-Wood Cemetery"
"Prevention of Patient Suicide - Medical/Legal Considerations"
Reiss, Walzer, Vasta & Starks, P.C. "Preventing Death in the Workplace: Law and Compliance"
"Comparative Approaches to Rationing Health Care Resources: The U.S., Britain and Canada"
"'Off the Count': Death Behind Bars"
"Macro- and Micro-Suicidal Events in the Lives of Adolescents in Detention"
"'To Be Or Not To Be' - When Society Has the Answer"
"Living and Dying with Aids - A Psychological Perspective"
"The Victim as Perpetrator: Dissociation and Violent Behavior"
"Adolescents and HIV Infection - The Second Decade"
"Charting Death: Progress Toward the End"
"Genetic Approaches to Developmental and Abnormal Cell Death"
"Cognitive - Behavioral Perspective on Bereavement and Bereavement Counseling"
"Aspects of a 'Good Death'"
"Separation and Loss: The Preparatory and Recovery Processes in Working with the Developmentally Disabled Population"
"Death in the Works of Michel Foucault"
"From the Nazi Death Camps in Poland (1992) to Guatemala (1993): Being a Witness"
"Death in Different Cultures: Past and Present"
"Song for the Duke: Memory as a Healing Tool and as a Celebration of Life"
"Anthropological Findings in Relation to the Youth Suicide Epidemic"
"Life, Death, and Contextual Individualism"
"Death in the Literature of Spain"
"Do Not Resuscitate - Issues and Resolution"
"Timing of Death Around Religious Holidays"
"Two Decades of Death Education/Suicide Prevention in Schools: What Has Been Accomplished? What Still Remains To Be Done?" "Bereavement Damage Control: Now and Later"
"The View of Death and Life in the Art of Meso-America"
"An Interdisciplinary Conceptual Framework and Taxonomy of Thanatological Perspectives"
"The Issue of AIDS: The Infected and Affected"